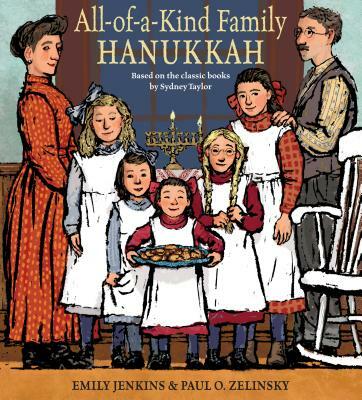 The beloved characters from Sydney Taylor's All-of-a-Kind Family return in this heartwarming picture book from a critically adored team--perfect for Hanukkah gift-giving! Acclaimed author Emily Jenkins (A Greyhound, a Groundhog) and Caldecott Award-winning artist Paul O. Zelinsky (Rapunzel) bring the beloved All-of-a-Kind Family to life in a new format. Fans, along with those just meeting the five girls ("all of a kind," as their parents say), will join them back in 1912, on the Lower East Side of NYC, and watch as preparations for Hanukkah are made. When Gertie, the youngest, is not allowed to help prepare latkes, she throws a tantrum. Banished to the girls' bedroom, she can still hear the sounds and smell the smells of a family getting ready to celebrate. But then Papa comes home and she is allowed out--and given the best job of all: lighting the first candle on the menorah. First published in 1951, Taylor's chapter books have become time-honored favorites, selling over a million copies and touching generations of readers. In this time when immigrants often do not feel accepted, the All-of-a-Kind Family gives a heartwarming glimpse of a Jewish immigrant family and their customs that is as relevant--and necessary--today as when it was first written. Jenkins and Zelinsky's charming compliment to Taylor's series perfectly captures the warmth and family values that made the original titles classics. Emily Jenkins has written many highly acclaimed books for children, including Water in the Park, a Booklist Editors' Choice and a Bulletin Blue Ribbon Book; Lemonade in Winter, a Publishers Weekly Best Book of the Year; and two Boston Globe–Horn Book Honor Books: Five Creatures and That New Animal. She is also the author of the popular Toys trilogy: Toys Go Out, Toy Dance Party, and Toys Come Home. She lives in Brooklyn, New York. Paul O. Zelinsky was born in Evanston, Illinois. He attended Yale University, where he took a course with Maurice Sendak, which later inspired him to pursue a career in children's books. He went on to receive a graduate degree in painting from Tyler School of Art, in Philadelphia and Rome. His first book was published in 1978. Among many other awards and prizes, he received the 1998 Caldecott Medal for his illustrated retelling of Rapunzel, as well as Caldecott Honors for three of his books: Hansel and Gretel (1985), Rumpelstiltskin (1987), and Swamp Angel (1995). Paul Zelinsky lives in New York with his wife, Deborah.